It was nearly 100 degrees outside — but the dogs had no way to escape the sweltering heat. Out in a field with no shade coverage from trees, around 200 sled dogs stood pacing around in circles and barking endlessly. Chains around their necks only gave the dogs a few feet to pace before pulling them back in the opposite direction. Plastic barrels with a hole cut out of the sides were all they had for shelter, and would have surely been even hotter inside. This was the scene earlier this month at Chocpaw Expeditions, a sled dog kennel in Ontario, Canada. 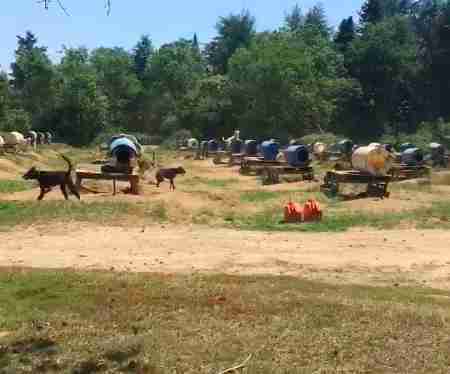 The dogs are used for sled dog tours in the winter — but in the blistering summer heat, when there’s no snow or tourists, this is their reality. This video was filmed on July 4 during a period of record heat waves sweeping the region. 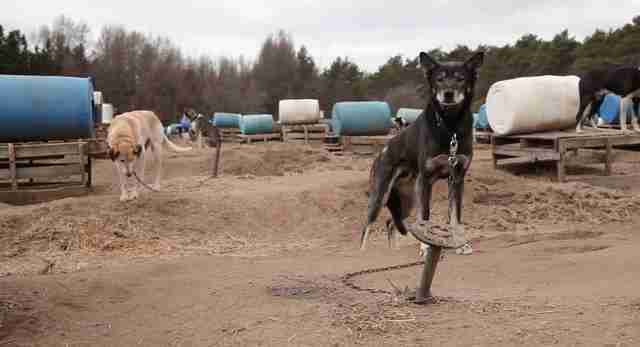 Sled dog advocate and filmmaker Fern Levitt was concerned about how the dogs were faring in these conditions — and after driving three hours to check up on them, her fears were confirmed. While she was taking some videos, an employee of the kennel approached Levitt, urging her to leave on the basis that she was trespassing on private property. Levitt has since reported the conditions to the Ontario SPCA, which says it has been to the property to conduct an inspection. While many dispute forcing dogs to live outdoors on chains, the Ontario SPCA Act allows it — as long as the dogs are given adequate shelter. This isn’t the first time Levitt has filed animal welfare complaints against Chocpaw Expeditions. She first visited the kennel in 2010, and was devastated to see the dogs being kept outside in a muddy field on chains. Many were continuously pacing back and forth, which is a common sign of anxiety in stressed animals. She returned during filmings for her 2016 documentary "Sled Dogs", which investigates the often despondent lives of the dogs while they’re off the trail. Levitt hopes that continuing to show the harsh conditions the dogs face throughout the year will inspire people to push for stricter laws to protect them. Until then, she fears, the dogs’ lives aren’t getting much better. 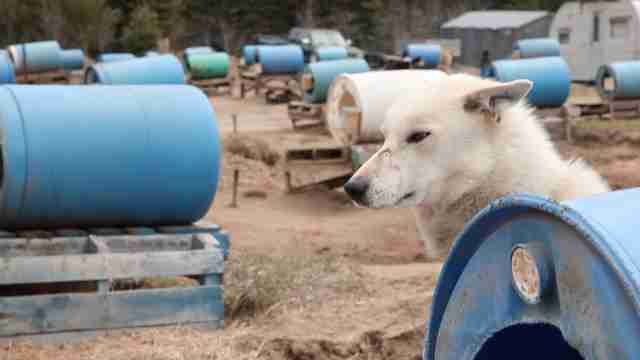 To push for stricter protections for sled dogs in Canada, you can sign this online petition. You can also pledge to never support a tourism company that keeps its dogs this way.